Much of what the world remembers about the Rwandan genocide are grim tales of betrayal, of neighbors killing neighbors and the slaughter of innocents. But there are other stories of people who resisted the urge to kill and who risked their lives to save the lives of others. American Carl Wilkens refused to leave Rwanda when the genocide began, even when urged to do so by his family, his church and the United States government. Wilkens was a missionary with the Seventh Day Adventist Church. He was in Rwanda with his wife and three children. "Before the genocide, we had heard rumors of pickup trucks loaded with machetes coming into Nyamirambo and some of the other townships," recalls Wilkens. "So you knew something was brewing." When the genocide broke out, Wilkens remembers, "In our house, we moved away from the windows and we had wide hallway and we all spent the night in the hallway trying to sleep." In a recent interview, Wilkens describes the situation in his Kigali neighborhood, as the killing began. "We were on the radio in our house and they were telling us over the radio there were people in the front yard being killed right now, please try and get help to us. I tried to get in contact with local authorities. There was no way. I tried the U.N. soldiers. There was no way. And all of a sudden, I looked up and there, in the doorway, are our kids. Just frozen. Listening to this, this horror play out over the radio." "Two lots over was a large house owned by Tutsi businessman. I think he was a banker. And as the killing began on this first day, as the sun came up, they had chucked their two little kids over the fence to a little house next door and their teenage son had burrowed under a pile of refuse in the backyard by the chicken coop, and mom and dad had barricaded themselves into the house, and for three hours at least, there was this banging on the metal doors - hammering and banging and gunfire, and eventually, after so many hours, they found and murdered our neighbors. Draped her body over the fence." 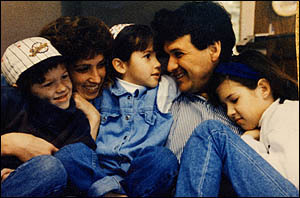 Soon after, Wilkens' wife and children were airlifted out with other Westerners, but Carl refused to go. He is believed to be the only American to stay in Rwanda throughout the genocide.